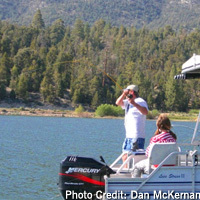 The fishing on Big Bear Lake just seems to be getting better and better. The cold, clear, mountain runoff water is just right for trout. Winners of the annual Memorial Day Trout Classic have landed rainbows over 18 pounds. The municipal water district goes all out to nurture the prize fish, even setting out artificial “homes” in the water to protect fingerlings from predators. But you don’t have to be a pro to hook a meal. Crappie and pan fish are plentiful and fairly easy for young folks to catch with bait or artificial lures. Seasoned experts say the Big Bear bluegills (some call them “sunfish”) eagerly snap up worms and carp are easiest to hook with powerbait or nuggets. Amazingly large catfish prowl the shallows and will take about any bait you can think of. You’ll find small mouth bass where it’s low and cold and their largemouth cousins come closer to shore. With a good strong line you might even land a 20 pounder right off the jetty. Naturalists urge anglers to throw bigmouth bass caught in the summer the back so they can breed. Don't forget your fishing licenses, bait, rod and reel try these great resources.